As the dog most likely to be found playing happily in any given back yard, a Labrador Retriever exhibits a charming, playful and resilient personality. This has made this breed the favorite among dog owners in the U.S., Canada and the United Kingdom. Because the original function of this dog was to retrieve fishing nets from lakes and rivers, Labs possess webbed paws to enhance their swimming ability, along with an innate love of water. Give a Labrador a swimming hole and a family and he will be happy for life. Labs are also versatile and intelligent, easily trainable as assistance and police dogs because of their highly developed sense of smell and willingness to please. Gentle, patient and extroverted, they are always delighted to interact with humans and other animals, making them the perfect pet for households with children and other animals. References to a "St. John's Water Dog" from diary pages written by explorer W. E. Cormack describe a dog behaving like and resembling a Labrador Retriever during the early 1800's. Also referred to as a "Lesser Newfoundland", the Retriever was later brought to Great Britain and finally the U.S., where the American Kennel Club officially recognized the breed in 1917. In the early 1980's, the last two remaining dogs considered full-blooded St. John's Dogs passed away. Easy-going, friendly and gentle, the Lab makes a great family dog as they crave activity, affection and interaction with humans. Their keen sense of smell and love of water make them a favorite among duck hunters as well; once a Lab discovers a scent, nothing seems to deter them until the origin of that scent is found. Labs also have an instinctive urge to carry something in their mouth but have evolved to handle items gently, since they have been bred to retrieve game without damaging it. In fact, a Labrador Retriever can be trained to carry eggs or other delicate objects in their mouths without breaking them. Until they mature at around three years old, Labs tend to exhibit the boisterousness and enthusiasm of a puppy, requiring a firm but loving hand to prevent them from becoming uncontrollably rambunctious. Chewing toys are a necessity for puppies since Labs may indiscriminately gnaw on shoes or any other unguarded items. Also, they tend to bark at noises from sources they cannot see, and is known as alarm barking. Since they have a trusting nature, Labs are not normally considered appropriate as guard dogs. 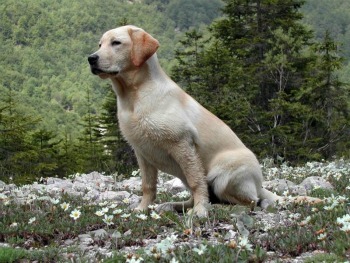 Coat coloring varies with Labs but basic features, such as its medium size of 60 to 80 pounds and broad head with pronounced forehead, remain consistent. Eyes are large, brown to hazel, and charmingly demonstrative with a distinct black lining that further enhances their expressiveness. A Labrador Retriever has droopy ears, which they love to have rubbed, that hang close to the sides of their head. A Lab is also capable of exerting powerful jaw force if necessary, but rarely do they actually inflict bite marks on objects unless it is a favorite chew toy or rubber ball. 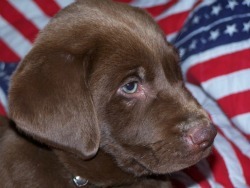 Full-blooded Labs have coats that are black, chocolate, dark red or cream-colored. Mixed Retrievers, however, can have blended coats, depending on the lineage variety. Predictably, a Lab's fur is water-resistant which prevents hypothermia from occurring from jumping into cold water to retrieve waterfowl. This is why his coat may seem slightly oily yet dry to the touch. In addition, Labs either shed twice a year or shed all year long when living in warm climates. When shedding is a problem, brushing daily can help alleviate excessive loose hair. Most of these health problems emerge in later adulthood, resulting from an active lifestyle and inherited autoimmune problems. Obesity, however, can be experienced by a Labrador Retriever at any age, as Labs use their expressive eyes to persuasively ask for extra food, something that a lab owner often finds hard to resist. A happy healthy breed, the Labrador Retriever is a good family pet as well as a trainable working dog. Smart and intuitive, they love to please their owners, and eagerly return any affection that they receive.